O ur fleet is composed of 17 car transporters. They are modern and reliable vehicles adapted to transport automobiles of almost all size. Our tractor units are from such companies as Mercedes and Scania and our semi-trailers constructions are from Lohr, Rolfo, Eurolohr and Rimo, which are among top transport equipment producers. All our transporters comply with Euro 5 and Euro 6 standards. In addition, they are adapted to load cargos directly from vehicle manufacturers’ plants in accordance with the highest technical standards. Our fleet is under GPS monitoring system which provides a real time monitoring of our car transporters. All our vehicles and cargos are covered by our business partner – Juwentus company. Since our forwarding department remains in continuous contact with the drivers, we are able to adjust the route and methods of operation to the changing road conditions. 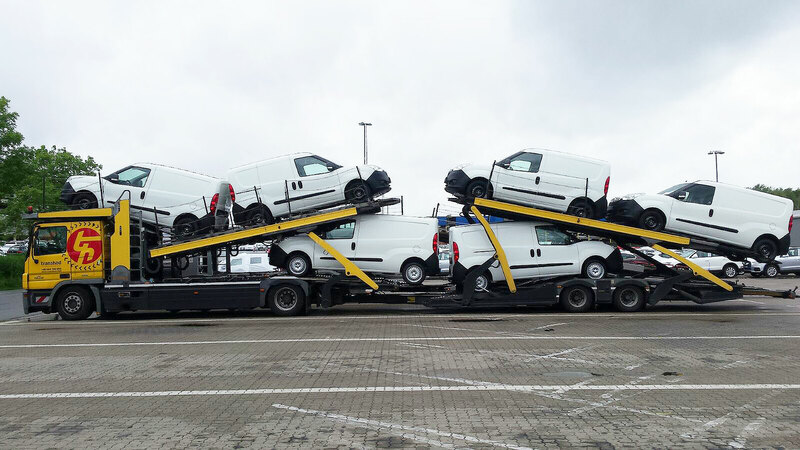 As our car transporters travel thousands of kilometers per month, they are regularly serviced and checked for damage. We only allow them to be used in road traffic once we are certain that they do not pose any danger neither for cargo nor for other road users. Safety of our drivers and of entrusted cargo is our priority. It is of a great importance for us to employ highly qualified drivers. In Transhad we are very proud of our well-prepared and highly experienced staff. It is thanks to them that cargos are properly secured and prepared for transportation, which is a guarantee of safe and timely delivery. Please see below some examples of cargo arrangement in our car transporters.